Instructions: Prepare a white card base 5 x 7 inches and layer it with a piece of the Burst of Spring paper 1/8 inch smaller all the way around. Cut a piece of the paper 2 1/2 inches wide and 6 7/8 inches long and place down the middle. Die cut one of the Diamond Lace out of white, add foam dots to the back and adhere to the center of the card, more to the top. Stamp the sentiment in black on white card stock and cut out with the arrows and Banner Die, add foam dots to the back and adhere to the center bottom. Stamp the Burst of Spring on white with the black ink, color in with the makers. Die cut using coordinating die, add small foam dots to the back and adhere to the center of the diamond lace die cut. Stamp the Cheery Pansy flowers on white cardstock with the black ink, color in with the makers and cut out with the coordinating die. Place in the Pansy mold and run through the die cutting machine, assemble and add to the card by placing one on top of each of the largest Pansies in the image. Stamp the butterfly on vellum, using the black ink and the black embossing powder. Die cut with the matching die, trim the swirls off, use the marker and color on the back side. Shape and adhere to the card. 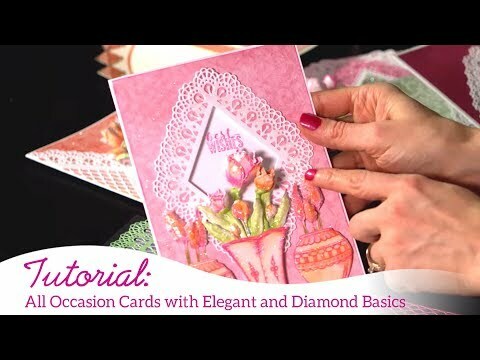 To finish the card, add glitter to the flowers and leaves, add Crystal drops to the center of the flowers.